Waterborne illnesses are on the rise in Puerto Rico in the wake of Hurricane Maria — and health professionals fear the storm's aftermath could unleash an epidemic on the devastated island. The death toll from the storm rose to 51 on Tuesday, with the two latest victims dying of leptospirosis, a bacterial disease usually spread by contact with contaminated water, Puerto Rico Public Affairs Secretary Ramon Rosario told The Associated Press. Authorities are investigating an additional 74 suspected cases of the infection as well, he said, and at least one previous death was attributed to the disease. “It’s going to be higher — it’s like a perfect storm for leptospirosis, ” said Llamara Padro-Milano, a nurse who returned last week from a relief trip to Puerto Rico with the American Federation of Teachers. "People are going to get sick and suffer." A spokeswoman for the Centers for Disease Control and Prevention confirmed to NBC News on Wednesday that they had received a shipment of specimens from the U.S. territory and were currently analyzing them at their laboratory in Atlanta for signs of leptospira, the bacteria that causes the disease. The disease is transmitted via exposure to the urine of infected animals, but humans are most commonly infected by coming in contact with contaminated water, especially through skin abrasions and the nose, mouth and eyes, according to World Health Organization. On Thursday, a group of nurses with the union National Nurses United who participated with the trip slammed the federal government's response to the hurricane in a news conference with Democratic lawmakers. "Door to door the nurses assessed and found people who may die before food, water and medicine can reach them," said Cathy Kennedy, vice president of the nurses' union. The group released a report Thursday that concluded "the response to the crisis in Puerto Rico from the U.S. federal government has been unacceptable for the wealthiest country in the world." The report called a series of measures to address the crisis, including expanding the use of air drops to provide relief supplies, additional personnel and financial resources, as well as an extension for filing disaster relief claims with FEMA. The over 70 suspected incidents of leptospirosis in just a month would represent a major spike: A total of 729 cases of the disease were reported from 1990-2014 to the Puerto Rico Department of Health, according to a 2016 study in the journal PLoS Neglected Tropical Diseases; of those cases, 78 were fatal. However, the study warned that leptospirosis was underreported or misdiagnosed as dengue. The disease has a wide range of symptoms including high fever, headache, chills, vomiting and diarrhea, but some may have no symptoms at all, according to the CDC. Leptospirosis is treated with antibiotics, but without treatment it can lead to kidney damage, meningitis, liver failure and death, according to the CDC. “The best that we can do was to teach people how to protect themselves the best way we knew how,” she said. Randi Weingarten, the president of the American Federation of Teachers who was in Puerto Rico earlier this month, said she was “alarmed” by conditions she saw on the ground, and that mudslides, a devastated infrastructure and destruction throughout the island had created a breeding ground for contamination. “I’ve never seen the effects of a disaster in the United States of America like this,” she said. “You had dead animals and you had debris in streams," she added, "so the sanitary conditions were terrible, and so you see a level of contamination as a result of this that’s terrible." She said the AFT union was coordinating with nonprofits and others to bring water filtration systems and purification devices to households and community-based groups in Puerto Rico through a project called Operation Agua. Padro-Milano said nurses were encountering many cases of conjunctivitis, also known as pink eye, because residents often did not have clean water to wash their hands. And mold from houses damaged by rain and floodwaters was contributing to respiratory conditions and diseases, she said. 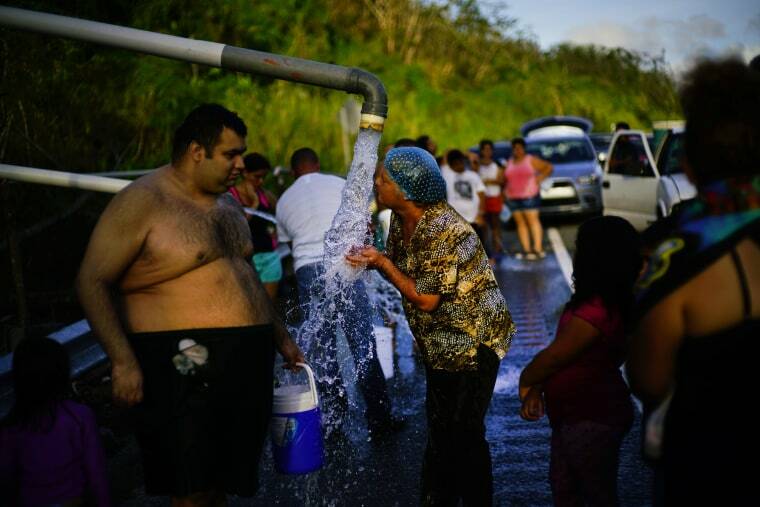 A quarter of the island’s population still lacks access to running water as of Wednesday, according to authorities, but the areas that do have water are not evenly distributed. While 87 percent of the metro area and 88 percent of the south have access to running water, only 46 percent of the north, 68 percent of the west and 77 percent of the east had access, according to a government website.